We’ve seen a great performance out of ERBB over the past few sessions, since including it in Thursday morning’s premarket report. That morning the company had announced that it had purchased the entire town of Nipton California (>>View PR) with grand plans to turn it into a cannabis tourism destination. Since then, ERBB has seen a big move on the chart, trading up from Thursday’s low of .0012 to a new 52-week high of .0046 yesterday, marking a three-day swing of 283% on the highest volume we’ve seen out of the stock since last fall. We’re interested to keep an eye out for updates on the Nipton project, which will apparently consist of several facets including production of CBD-infused water sourced from local aquifers. ERBB is a stock we’ve followed for years, but we’ll want to pay extra attention in the weeks and months ahead to stay on top of that story and see how it affects the stock. Valeant Pharmaceuticals International, Inc. VRX – Despite a Q2 loss and guidance reduction posted in its report, VRX, which had been on a downtrend for several sessions prior, surged in premarket trading this morning. We’re going to want to try to take advantage of the volatility created here with a set of options to track for potential swing trades. .
We’re going to be watching the VRX Weekly $16-17.50 Calls which could see some big activity following a potential early dip from profit-taking followed by a rip to new highs. Michael Kors Holdings, Ltd. KORS – On the flip-side, KORS is a stock that was experiencing a pretty good uptrend for an extended period leading up to its own earnings report, in which the company easily exceeded Wall Street’s expectations, and raised guidance. Like the previously mentioned play, we’ll look for the classic dip-and-rip formation, and will be tracking the KORS Weekly $41.50-43.50 Calls as we head into this midweek. Our regular readers may be tiring of so many mentions of INMG in such a short span, but the stock continues to soar to new heights on practically a daily basis, and yesterday, the intensity of the bullish pattern increased to impressive levels. Once again, the stock maintained more than half of its daily increase into the close on more than five times the monthly average volume, so we’ll need to continue to keep our heads on a swivel with INMG. At some point, the stock will peel back off of these impressive highs and that’s when we’ll be looking for what could be a serious dip-and-rip pattern. We alerted on SPU in Monday’s premarket report after noticing the stock was searching for a bottom, with a monstrous gap to fill on the chart to the upside. Tuesday’s session brought an end that search for a reversal, with SPU bottoming out at 2.30 before reaching 3.3299 yesterday. That’s an upswing of 45% and we will certainly want to continue to monitor SPU, which still has a mammoth gap to fill on the chart. 04/20 Holiday Reminder: We always have our eyes on the cannabis sector, but will intensify our focus today especially, given that it is the marijuana counter-culture’s main day of celebration for the year! Many companies in this arena use it as a promotional tool, and activity in the recreational space usually reaches a frenzy during this period, so be vigilant, and Happy 4/20 to all! NVAX continued its multi-day recovery with a fourth straight session of intraday gains leading to a new high for us yesterday. We’ve talked about it almost every day this week, initially bringing it up in Monday morning’s report; at the time the stock was trading as low as 1.36. It has made some nice, steady progress, and yesterday the stock made its way to high of 2.25, marking an intraweek upswing of 65% on extremely heavy volume throughout. We’ve also taken notice of series of Form-4 buys that were reported after hours yesterday, the largest of which was a 100,000 share block at an exercise price of 1.72. We’ll look for the stock, to maintain support at or above that level on any pullbacks moving forward in order to stay interested in tracking it. We’re definitely going to stay on its trail heading into next week, provided it can hold support in the channel between .0072 and .01 on any upcoming pullbacks. Part of our bottom-watchlist that we submitted for Tuesday morning’s premarket report, AIII has made solid steps to the upside throughout the rest of the week, confirming the fact that we timed the bottom with absolute precision. From Tuesday low of 1.0194, the stock has sustained a good recovery, and made its way back to a high of 1.32 yesterday (+29%). This is another one we’ll continue to follow into next week, as there still appears to be room for it to run. 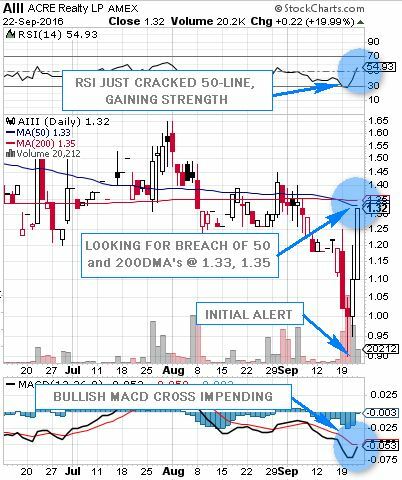 As we’ve pointed out on the annotated chart below, the RSI is gaining strength having just breached the 50-line, the MACD is on the verge of a bullish cross, and the PPS is approaching key resistance at the 50 and 200DMA’s of 1.33 and 1.35 respectively. We’ll continue to monitor the situation as we close out another trading week.